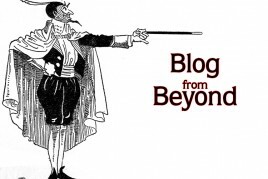 Welcome to my first blog. Everything you didn’t need to know about me. Sounds like you have a lot of time on your hands. So I tell you what … I will try to make this information useful for you, technically, and as a performer. No pie-in-the-sky theories. No cockamamie algorithms. Just conclusions drawn from experience and observation. One comfort I have here, is that this blog is definitely not a democracy. Sorry, but I have no interest in opening up dialogs with the entire world and arguing fine points of magical “theory,” or how many angels will fit on the tip of a wand … just so you know. If you don’t agree with me, bless you. Click on the next page. No harm, no foul. But if the content somehow proves helpful to you, then perhaps there might be some purpose for this after all! I will update this blog sporadically, so check back occasionally and see what’s new. Better yet, join my mailing list and get an email notice of new entries, new books and DVDs, lecture and show schedules, and anything Carney related. I only send out mailings quarterly, so you won’t be bothered too often with my rants. So until the next time, best of luck. Hope to see you back again soon. Copyright 2012 by John Carney and CarneyMagic. Not to be reproduced without express consent of the author. One of the most common questions from aspiring magicians is, “How do you develop an act?” I regret that there is no clear-cut formula that I can offer. It is mostly a matter of committing to a project. Creativity is a matter of developing a spirit of adventure in play. Contrary to the popular belief, great ideas rarely appear all at once, complete in every detail. Rather, it is a process. Even Leonardo da Vinci discarded many sketches and ideas before he discovered the crystallized version of the Mona Lisa that we know. I believe that every one has the potential to be creative. I don’t think it’s a matter of something you have or don’t have. I believe it is a muscle that you use or don’t use. It used to bother me because I felt that I was not as good as the people I admired most. Then, I realized that I was an individual, with my own unique potential and my own strengths and weaknesses. My heroes are such because they are like no one else, in the same way that no one is like me … or you. Discover what you are best at, and concentrate on that. Don’t imitate your heroes, emulate them. In developing new routines, you have the opportunity to dig down deep and draw on your own unique experiences and frame of reference, which can never be duplicated by anyone in the world. I’ve heard it said that the most interesting singing voices are those closest to the singer’s natural speaking voice, unique and unaffected by trends or convention. It is all well and fine to be influenced by those you admire, but at some point you must develop your own voice. Ironically, the thought that we might not be creative is the very thing that blocks us from being creative. You must cultivate the courage to try, to risk failure and to realize the consequence of any small failure in the context of an entire life or career. This same fear accounts for much of the stealing in the world of magic. Stealing someone else’s ideas is a form of fear. In stealing, the thief is denying his own self worth. He is giving in to the idea that he has nothing to offer. He has given up on himself. It’s pretty difficult to get anywhere if you don’t know where you are going. You will need a roadmap. Deciding what you want may be your biggest chore. Clearly defined effects are much more difficult than methods. You might find it helps to start with a general effect or premise, then list all the things associated with it. Study any pertinent material and take notes. Be specific. Don’t just think, “I want something great that everyone will like and think is amazing. “ Pick a concept or scenario, then run with it. Each situation will present it’s own unique possibilities. Now with all your collected information, make a list of ideas. If you set a goal of crating 20 ideas with your premise, write those down, then, just when you think you can’t think of another single idea, try thinking of not just one more, but ten. You will surprise yourself at how resourceful you can be if you discipline yourself to push harder. Good ideas are rarely the first that comes to mind. Sometimes they are the 38th idea, or even the 138th. Try different combinations and ask “What if?” without limiting yourself in any way. It doesn’t have to be practical at this point; you are just trying to get the ball rolling. If, for instance, you wish to make a bouquet of flowers bloom, make a list of things associated with flowers. This might included bees, flower pots, seeds, water can, and so on. Now think of a location in which this effect might take place. If the location is a park on a spring day, other objects, such as a park bench, a newspaper, or a child’s ball, all hold the possibility of magical influence and integration into your routine. Gather some of these props before you. Now, start to play. If you are totally unlimited by method and practicality, what sort of magical things would happen? Think of the journey in hundreds of small steps instead of one giant leap. Break things down to a few small, attainable goals. A sketch, a list of materials, or a trip to the hardware store can take the idea out of your head and set it before you in a form you can play with, molding it into your vision. Start with shopping for materials. Get everything in front of you where you can play with it. Don’t worry about beauty, just get a working model. Most everything I do started with hot glue and duct tape. Expect to make lots of small alterations to your original concept. A small prototype made of cardboard and glue, or gimmick fashioned from wire makes changes easier to implement. You want a three-dimensional model that you can play with, enhancing further visualization. Simple prototypes may not be pretty, but you shouldn’t waste time on unnecessary minutiae such as precise measurements and perfect appearance. Quite often, you may have to cannibalize an existing prop, tearing it apart to make a new one. We often feel an unreasonable reverence for props and are reluctant to desecrate them. But creation often comes from destruction. By destroying older ideas and props, we make space for brand new ones. I find it helpful to have a deadline. I can procrastinate forever, but as soon as an obligation is breathing down my neck, I find the energy to get things done. It shouldn’t be a deadline that you can’t meet. Instead of an audition for a Vegas showroom in a month, try a five-minute spot at a coffee house, a party, a church, or office party. Do it as many times as you can, with or without money. Experience is the key. I can an show you how to swim, the basic techniques of moving your arms and legs, but until you jump in, you’ll never be a swimmer. If you practice in the shallow end of the pool, you’ll gain confidence and eventually move to the deep end, then a lake, and next, the ocean. Now, are you performing as yourself, or as a character? If you wish to perform as a character, you must realize that funny voice does not a character make. A compelling, interesting character has a world view influencing everything he does on stage, from the choice of material, to the attitudes and behavior you will exhibit. This will result in distinguishable traits that your audience will latch onto in an attempt to understand you and your motivations. You may wish to draw up a history for your character, including where he was born, how he was raised along with some interesting events in his life. You may not use these facts in your act, but they will serve as subtext to subtly influence the entire character and make your acting “choices” more motivated. When are you finished? Never! No matter how many years you may perform the routine, there will still occasionally be something that will take you by surprise. With these things noted and performance provision made, your act will improve. There is no short cut. Throughout, remember that the end goal is fun: the fun you will have developing your own ideas, as well as the fun your audiences will have when they see smart, thoughtful magic. Copyright 2002, John Carney and Carneymagic. No part may be reproduced without expressed permission from the author. For various reasons, I rarely give private lessons. But here are some thoughts on what I would try to teach someone, if they were my student … so that they could advance, and eventually continue on their own. These are not so much rules, as guidelines. What’s the secret of being a better magician? Setting a Personal Ideal … not just good enough. Each new trick should have an ideal vision behind it. What would it look like for real, without moves? Malcom Gladwell speculates 10,000 hours of study, experimentation and practice to master something. Become your most observant, objective critic, and your most nurturing, positive minded coach. Build up mentally. More than just what is on YouTube and at your web site dealer. The latest trick is fun, but is it what everyone else is doing? Is it a performance piece, or a “product”? Are you responsible for the result? 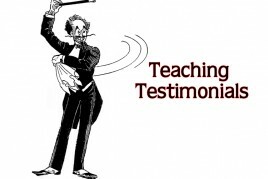 Have you worked on the presentation, details of handling, technique…. really thought things through? perhaps the trick’s creator, deserves that approbation more than you. integrity and responsibility that entails…… art will be a part of what you do. First, get it off the page. Memorizing the moves and the sequence is the first step …this is where most magicians stop! Technical….. repetition, to work in muscle memory. Alternate mechanical and thoughtful until you have a smooth, workable method. If you can’t explain the effect in a short phrase, it’s not a memorable effect. Cards Rise, appear or change. “He did a lot of cool things” is not an effect. If they can’t talk about it the next day, they won’t remember it and your impact will be minimal. Even if you don’t follow it word for word, you have a foundation for what you will say. You can move parargraphs, change words, cut words, and eliminate or substitute entire parargraphs. After you have done it a dozen times or more, you are on your way. If you change it incrementally over many shows, you will be surprised how much it has changed over time…… sometimes not even close to your written script…. but this will get you started. Respect past masters …. if you just think magic starts and ends with youtube and the latest magic product, your are doomed to mediocrity. Don’t just have one person that you listen to……. it’s great to have a guide, but take in good ideas any where you find them….. and toss out what doesn’t make sense. Much different than just buying things. Learn from past masters, but then exercise your own creativity. How can you fix weaknesses? Present it differently? Enhance the effect through streamlined methods, understanding of showmanship, presentation and theater skills. Video is fine, but only a small percentage of magic knowledge is available on video. And it does not force you to think any differently. You will most likely do it exactly as the person in the video, with the same method, gestures, jokes. Books give you basic concepts where you can read between the lines, and interpret things to come up with something new. But not just originality for originality’s sake…. it must solve a problem or make it more practical or a better effect. Just changing a move or the color of the cards does not bring anything truly new to the idea. OK to work on lots of things, but come back to a core of strong effects…… over time these would become your “go to” routines. Effective and practical under most circumstance……. If you keep trying to improve, even these routines you have done for years, they will become like gold to you. You can always rely on them and when you do them, you are always seen at your best. Learn from your mistakes… make adjustments….. try again…. repeat. Good technique is a series of incremental adjustments, eventually resulting in a consistent outcome. Beginners always know the easy way, they never know the simple way. Simplify means taking out anything that detracts…….. awkward moves, susupicious moments…. making things practical and not something that just works “most of the time”…….. Simple does not mean easy…… it is a distillation to an essence. Exactly was is required, no more, no less. Many simple things take great skill to eliminate tedious procedure and superfluous action. If you don’t decide what you want to project to people, you are leaving it to chance. If you are not a funny guy, settle for being of good humor and a likeable guy…. nothing is more uncomfortable than someone trying to hard to be funny….. or someone trying to be dashing and romantic, when they don’t fit the role. Have daily, weekly, monthly, long term goals. If you practice 5 days a week, for 30 minutes a day, totally focused without distraction….. you won’t be a great magician, but you will be miles ahead of most. If you raise that to a couple hours a day…. in just a few years, you could be one of the greats. Choose material according to what people like, not just a clever principle, prop or gimmick that you like. Goal of a contest should be self improvement, with a deadline and goal. If your only goal is to win, you might lose. Otherwise, you have advanced and have an act you can use in the real world. Not everyone knows what they are talking about. Even if you think they do. If you are only learning from videos, you are leaving out an important component in your magical progress: your own interpretation. Videos teach us to imitate, not just technique, but the style and manner of the performer you are watching; his timing, his sense of humor, his gestures. To remedy this, I enthusiastically recommend books as your major information source, with much to be learned “between the lines”. In listing the following books, I have included a potpourri of titles and subjects. I feel that it not only makes for a more complete conjuror, but also stretches one’s possibilities. It keeps the love for magic in a perpetual romantic stage, preserving our interest long after the “bloom is off the rose”. It is impossible to know it all, and when you believe that you do, you are no longer capable of further learning and growth. A general understanding of dove magic will help you with your coin magic, and a familiarity with illusion design and principles will assist you in creating smaller gimmicks and props. As Edwin Sachs suggests, one is not ready for stage magic until a general mastery of “small magic” is attained. The skills learned working for a few people at a time provide an indispensable cornerstone of technique and general performance skills. These skills provide a springboard for making the rather prodigious leap onto the stage. Here I specifically list sources to find direct methods and clear effects. I have included material with a wide variety of objects for both stage and close-up. I have purposely avoided mention of most current books and those that deal exclusively with technical minutia. Current “pop” tricks and books should be seen in proper perspective. Trends come and go in magic. The classics will always provide a strong foundation that will stay the weather of many years. Many volumes listed below are out of print but still available through dealers in used magic books. This list could be regarded simply as a few books that I, personally, would bring to the proverbial desert island. I have many other favorites, but I believe that these books alone would provide enough material and knowledge to keep any of us thinking about magic for a lifetime. I have found biographies of magicians to be quite fascinating and inspirational. Except in the most deifying interpretations, they show the greats of the past as real people like ourselves, experimenting and sometimes failing, but remaining relentless in their pursuit of the hidden secrets of the craft. My favorites in this genre are Carter the Great, The Memoirs of Robert-Houdin, The Life and Times of Augustus Rapp, and David Bamberg’s Illusion Show. Milbourne Christopher’s Illustrated History of Magic and David Price’s Magic offer hundreds of fascinating profiles and insightful perspective on magic’s development. Johann Hofzinser’s work is exceptional in the history of magic with beautiful, poetic plots and innovative, ingenious methods. J.N. Hofzinser’s Card Conjuring and The Magic of J.N. Hofzinser will inspire awe as well as new respect for the artistic potential of the magic craft. Sleight of Hand by Edwin Sachs is probably the single most complete book ever written on magic. 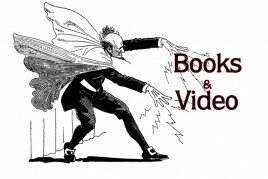 It includes both stage and close-up magic, chapters on technique, presentation, and all the peripheral skills necessary for great conjuring. David Devant, arguably the greatest conjuror in England’s history, has written several terrific books on magic including Secrets of My Magic and My Magic Life. He performed both sleight of hand and illusions, with all his books written from the perspective of a real performer. Together with Nevil Maskelyne, he wrote Our Magic, one of the most thorough and thought-provoking magic books ever. Not all the ideas presented here will be immediately understood or applicable to what you do. However, if you absorb these concepts, the more you perform, the more relevance they will have for you. I have reread Our Magic every few years and find that each time I discover something that I have learned through experience, along with a foreshadowing of what I have yet to learn. If you want to understand misdirection and timing, there are no greater authorities than John Ramsay and Tony Slydini. Ramsay’s student, Andrew Galloway, has written The Ramsay Legend, The Ramsay Classics, and The Ramsay Finale. In these superb books, many of the art’s most subtle secrets are revealed along with some devilishly clever magic. Lewis Ganson’s The Magic of Slydini and Leon Nathanson’s Slydini Encores, two very important books in my early development. Slydini was certainly a master of misdirection, but the greatest lessons he teaches are those regarding timing and choreographed movement. Every magician’s library should have reference books covering a wide range of subjects. The classic Modern Magic by Professor Hoffmann, along with the sequels More Magic and Later Magic, are some of the most exhaustive studies of the magical art. Everything from mechanical principles, prop construction, sleight of hand, and presentation are covered in these indispensable volumes. No magic reference shelf would be complete without S.H. Sharpe’s Conjuror’s Optical Secrets, Conjuror’s Mechanical Secrets, Conjurors Psychological Secrets, and Conjuror’s Hydraulic and Pneumatic Secrets. These excellent books give a brief, understandable overview of nearly every major principle in magic. Sharpe wrote several inspiring books of magic theory, recently republished in a single volume as Neo Magic Artistry. The original six volumes of The Tarbell Course in Magic contain enough material and sound advice to construct several excellent career-building routines. I would, of course, recommend any book of material by or about the magic of “The Professor”, Dai Vernon. I consider Lewis Ganson’s The Dai Vernon Book of Magic to be the most complete of all his books. It contains magic with a variety of objects, with each routine a lesson unto itself. Be sure to read and reread “The Vernon Touch” chapter at the beginning of the book. This section effectively encapsulates his theories on sleight of hand that may be applied to every routine you undertake. 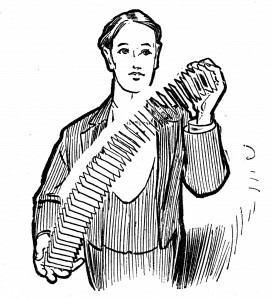 Vernon was, without a doubt, one of the world’s greatest exponents of pure sleight of hand. Magic with Faucett Ross, one of my favorite books, contains many practical, audience-tested routines for the stage from my early mentor and friend. 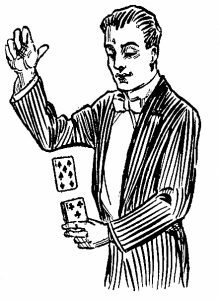 Faucett understood the meaning of a good effect and was skilled at transforming standard trick, through routining and fresh combinations, created great magic entertainment. In The Books of Wonder, Stephen Minch presents the superlative work of Tommy Wonder. This two volume set is filled with brilliant, visual magic and thoughtful essays. Wonder does not demand that we agree with his “theories”, instead he inspires us to think for ourselves, using our own experience, ideas and hard work to elevate the art though our participation. This list is by no means complete, but should serve the reader in good steed. Use these books for reference, guidance, and inspiration. Through your appreciation and respect alone, significant improvements will begin to show in your magic. Knowledge is indeed power, the power to manifest your ultimate potential. Hot Tip for Magicians with Dry Hands. I never thought I would have this problem, as I always had naturally moist skin. But age, and cold, dry weather often make it difficult for me to palm cards, coins, or other objects without them squirting out of my hand, or make it difficult to subtly push, grip, or otherwise gain purchase on objects in manipulation. I have tried every conceivable cream, salve, unguent, and moisturizer in my search for the proper gripping power. Most hand creams are greasy, and have the opposite effect you want. I’ve even tried dozens of other things that would not normally be used as hand cream. Vaseline, hair gel and hair spray, aloe gel, lemon juice, and many other unconventional things. To my embarrassment, I’ve even tried a lady’s product called Vagisil. I had moderate success with a product called Golden Touch, which was Vernon’s favorite. Another old world product is Corn Husker’s lotion. Others have had success with Sortkwik Fingertip Moisteners, used by bank tellers to count money. But perhaps my search is over, because I have happily found one of the best solutions … Chalk. Gymnasts and rock climbers typically use a chalk bag to apply a thin coat of chalk to their hands, so they can grip the crags or bars, without slipping, or sticking. But the powder version is too messy. There are several brands of “liquid” chalk … here’s one I tried and it really does make a difference. I’ve seen the same product on different sites at a higher price …. you can find it on amazon too. This stuff is “the shizzle”… works very well with just a dime size spot rubbed into the hands. The grip is good and it will last the duration of your show. The one drawback is that if not evenly distributed, it may leave a slight visible white residue. If your hands are naturally moist, don’t bother. But if you are frustrated with dry hands, give it a try. Copyright 2016 by John Carney and CarneyMagic. This article originally appeared in the November 2011 issue of M-U-M. Nothing can be as empowering, or as crippling, as criticism. Without an objective viewpoint of how things are working, we can’t get to where we want to go, or indeed, even know if we are on the right path. A helpful critique is not just about what is “good” or “bad,” but an exploration of different options, merits, and faults. My pal Joel Hodgson once said to me that the difference between the work of an artist and the work of a hack was the number of aesthetic decisions made along the way. To the hack, everything is “good enough,” or “gets by.” But merely turning a crank on a box does not make a person a musician. The artist has many decisions to make because he has an ultimate ideal in mind. He has a clear idea of what he wants to achieve. The path may be fuzzy at first, but it comes sharply into focus with hundreds or thousands of hours of creative choices and a thoughtful reason for keeping or discarding any particular piece. It either fits in the bigger puzzle, or it does not belong. The artist is willing to chip away at the marble, piece by piece, until (like Michelangelo) his David is revealed. These chips seem insignificant when viewed individually, but together they determine the whole. But first, the artist must able to visualize in his mind, what David looks like. It is imperative that the artist be aware of the quality of his self-criticism. It is useful to be critical of details; it is not useful to be critical of your personal potential. It is counterproductive to shake one’s self confidence with toxic self-talk. Your inner voice can either move you forward or it can cut you off at the knees. Magic master Dai Vernon could be very sharp and critical of those he felt were not making the slightest sincere effort. “Get out of magic!” was a familiar remark. He had no patience for those who tried to cut in line. But I never saw him drag down anyone who had obviously made a genuine effort. As the scientists say, you have to “show your work.” There is no one right or wrong answer. There is only thinking, or not thinking at all. It is a fantasy that artists are born with their talents in full bloom – they are the “lucky” ones, they simply will it, and art appears before them. You see the finished product; you don’t see is all the preliminary sketches, the failures and half triumphs, the discouragements, and the renewed passions. This preparation eventually allows them to “get to it” faster, which might make it look easy, because you don’t see all the study and experimentation that came before. In his book Outliers, author Malcolm Gladwell gives us a very plausible formula when he claims the key to mastering something is practicing and analyzing a task for ten thousand hours. The key is to keep focused, not just on repetition, but on achieving comprehension; to truly understand something, as opposed to just memorization or pointless skill. Skill is useless without vision. I love the guitar, and have practiced most every day for fifteen years. But whereas I am a decent player, I still have not invested half the time that I have spent studying magic. When I compare the hours, it is clear why my playing is not as accomplished as my magic. But then again, I still practice every day, and in the coming years, perhaps I will clock in with the necessary hours to attain some mastery – that is, if I evaluate each day’s lessons and learn from my mistakes as well as my triumphs. All creative endeavors are a matter of problem solving, problems that you yourself create! These problems are what you see standing between you and the ideal you have in your mind, the criteria that will define your effect. Recognize them, and address them. This is where your internal “judge” comes into play. But make sure this judge is not only the most objective and wise, but also the kindest and most nurturing. Don’t put yourself down and say, “I keep dropping the cards; I’m terrible at sleight of hand.” Instead, ask, “Why are the cards dropping from my hands? Why am I flashing this move? Why is it making noise? How would this be perceived by an audience member?” Focus on what you can change or find alternate procedures. I have often wondered where some beginners or hacks get such great confidence when they have so little ability, wit, or understanding. How does someone fly across the country to audition for American Idol, so confident that people will see their star quality, when their only preparation is singing with a hair brush in front of the bathroom mirror? These people never consider for a moment that they might not have talent. Somehow they have mustered the nerve to get up on a stage in front of millions of people, where it is immediately apparent they have not developed a talent, or for that matter, self awareness. Ignorance is bliss. Michael Close brought my attention to an official term that has come to be associated with this phenomenon: The Dunning-Kruger Effect. Stupid and unskilled people often have a bias that renders them unable to properly evaluate their performance. Whereas you would think they would be insecure about their lack of knowledge, in fact, in many cases this person has illusions of superiority. They have a “metacognitive inability” to recognize their mistakes. They don’t know that they don’t know! Without this acknowledgement, mistakes are not corrected and no growth is possible. Many competent people, on the other hand, suffer from poor self confidence because they assume that others have an equivalent understanding of the subject. As Dunning and Kruger conclude, “the mis-calibration of the incompetent stems from an error about the self, whereas the mis-calibration of the highly competent stems from an error about others.” Self doubt must be healthy and balanced if it is to drive achievement as we attempt to understand something, or master a task. Brashness and baseless confidence can temporarily steamroll your way into money and gigs, but without honest self critique, nothing of value is produced. You might “cheat the system for a while,” but ultimately no one wins – neither you nor your audience. Being creative and productive requires confidence, and the belief that we have something new to say, a new way to say it, and that we are capable of achieving it. But baseless confidence can be a liability without honest, objective evaluation. Strive for balance. Who would deny the pleasure and thrill of being appreciated by your peers, winning a contest, or receiving an award? Every human being wants to be appreciated. Winning can offer us encouragement to keep going, or indicate that we are headed in the right direction. It is not, however, an indication that we have arrived. No true art can be measured for value. It is totally subjective to the tastes and sophistication of the observer. You can measure how many dollars an act makes, but this is a measure of commercial value, not artistry. You can put the latest bubblegum music against Bach and Debussy, and the classical would claim the booby prize most every time. Art is not a popularity contest. It is about stretching boundaries and creating something new and beautiful, for its own sake. A contest has the most value as an incentive, and as a deadline. We are able to super focus our efforts, as the stakes, the rules, and the conditions are very clear. If we win, it can be a future motivator, a reminder of what we are capable of doing when we use this focus. It is a parting of the clouds, not proof that we have reached the mountain top. If winning any award or contest is your ultimate goal, you are limiting your ambitions. No one likes to be criticized, even when they ask for it. Honesty is not always appreciated, or indeed, desired. I admit I am no different. Criticism stinks, even in situations where the person doing the critiquing is well qualified, might have a valid point, and could really improve my act. It’s hard not to take it personally. But the mark of an intelligent, growing person is that they are able to at least thoughtfully consider another point of view, and explore other options. We can’t expect better results if we don’t change our procedure. Usually when a person asks for a critique, he or she is really asking for praise and encouragement (or at the very least, simple, easy-to-implement changes). “I think a red handkerchief would show up better!” But what we need to hear may be more painful. “You are flashing.” “That looks suspicious.” “There is no motivation for that action.” These are harder comments to accept, because they will take a substantial amount of thought, time, and effort to correct. Despite someone saying, they “really want an honest opinion,” you can be sure that there will be plenty of drama and resistance offered to even the most expert advice. If you are paying for the advice, you get what you paid for, but if you don’t pay, you most likely won’t value the time that went into the advice, which includes years of building up that unique store of knowledge. And if you doubt the punishment that awaits the reluctant critic, Google for screenwriter Josh Orson’s article in The Village Voice, September 2009. The title of the article is “I Will Not Read Your #%@** Script!” It pretty much sums up this “lose-lose” situation. It is infinitely easier to see the faults in others than ourselves. We can see the splinter in our neighbor’s eye, but not the two-by-four that is sticking out of our own. Other’s flaws seem so obvious, but we tend to build defenses against seeing our own. This creates a “perception bias.” We don’t want to see that move flashing in the mirror, so we blink. If we can just keep our eyes closed, we can cling to our fantasy of competence. Before you go off critiquing everyone in sight, first ask, what qualifies you? What is your motivation? How well do you know the person, and would they value your opinion? Why should they listen to you? Maybe the person has considered many more options than you, and settled on this one for a good reason, reasons you could not understand. 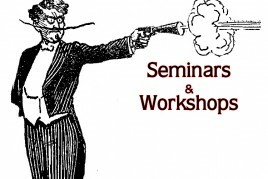 I occasionally hold workshops where participants demonstrate routines for me and the rest of the class, and I offer coaching. I realize this can be nerve wracking, but it is far more valuable than a lecture or even private lessons. You not only learn specifically what you, yourself need to work on, but by watching the performance and coaching of others, you learn much more that applies to all of us. There are many common mistakes we all make, points that may not have otherwise come up in our own critique session. I am very careful of the language that I use in addressing an individual’s issues. My sole purpose is to be of help to the student, not to parade my authority and make them feel small. Phrasing and tact is important. It must build, not destroy. It is a cruel truth that many teachers, in and out of magic, are tactless and unspecific, and this makes them bad teachers. Knowledge is one skill, teaching is another. Teaching is not just about “facts.” It is building a spirit of curiosity and confidence, and serves as a road map for learning on our own. Critiques must be phrased in terms of what the student can do and can change; it must not simply be the pointing out of flaws. If the student is given something to live up to, they will strive to reach it. If they are torn down, they may likely toss in the towel altogether. I want to motivate students to look deeper, to invest more of themselves, and to reach their potential. So be careful of how you critique yourself and others. No one has yet to build a statue in praise of a critic. This may be for the best, because the birds might just give them a taste of their own medicine.